we put Kiini Ibura Salaam's When The World Wounds to the test! What is When the World Wounds about? When the World Wounds is my second short story collection, in which I explore the dark, the sensual, and the mysterious. The three stories, two novelettes and one novella collected in When the World Wounds examine the tumultuous nature of the human condition through such wild imaginings as sensual encounters with deer, escapism in a dystopic prison, and volcano women. In the collection, I experiment with sound, point of view and form. “The Taming” is written from the limited point of view of a lupine creature trapped in a sinister confinement that is beyond the creature’s understanding. 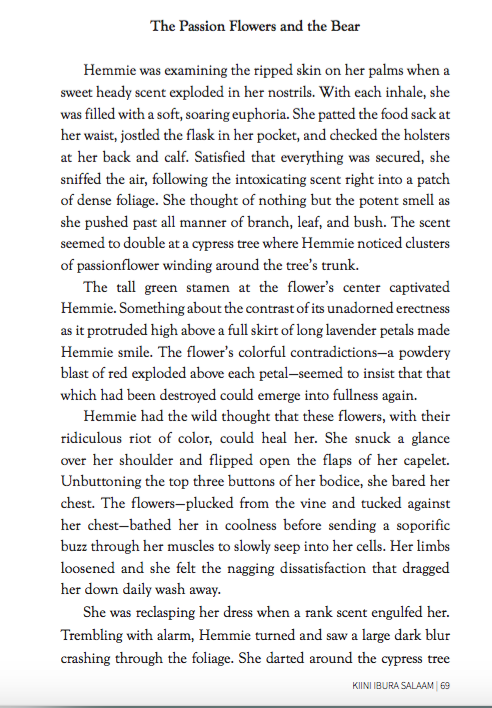 “Hemmie’s Calenture” unspools like a hoodoo tall tale as a woman escaping enslavement is thrust into a war between gods. I dip into the alien world with “The Pull of the Wing,” which is the prequel to my popular Of Wings, Nectar, and Ancestors trilogy. I close the collection with “Because of the Bone Man,” a novella that transports readers to the desolate landscape of post-Katrina New Orleans and the struggle of the city’s culture bearers to carry on. The goal is to capture reader’s sense and imaginations while carrying them through our world’s callous and perilous landscapes. Please set up Page 69 for us. What are we about to read? 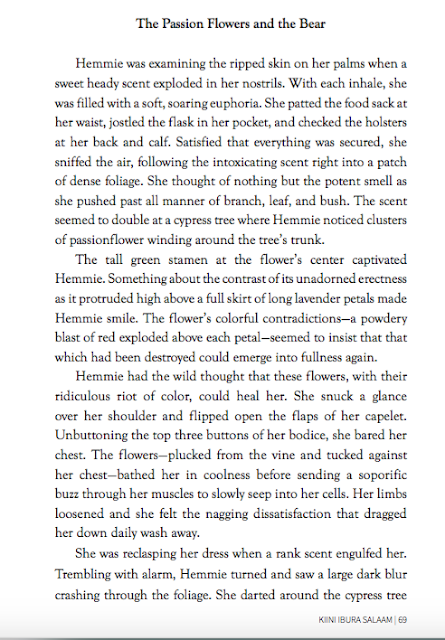 Page 69 is from the novelette Hemmie’s Calenture. At this point in the story, Hemmie has escaped a plantation and barely survived. Feverish and on the brink of death, she is saved by a powerful god who thrusts her on an episodic adventure that takes her through the swamp and into the heart of the Civil War. In this scene, Hemmie has just arrived to the swamps and is about to have a frightening encounter with a bear. Do you think this page gives our readers an accurate sense of what the books is all about? Does it align itself with the book’s overall theme? Given the fact that When the World Wounds is a collection, I would say that no individual story represents the whole. I try to write stories with different language, sensations, and rhythm. But the in medias res—the sense of being placed in the middle of the action is 100% aligned with the rest of the book. Kiini Ibura Salaam is a writer, painter, and traveler from New Orleans, Louisiana. Her work—which encompasses speculative fiction, erotica, creative nonfiction, and poetry--is rooted in speculative events, women's perspectives, and artistic freedom. Her book Ancient, Ancient—winner of the 2012 James Tiptree, Jr. Award--collects sensual tales of the fantastic, the dark, and the magical. Her fiction has been published in such anthologies as Dark Matter, Mojo: Conjure Stories, Black Silk, and Dark Eros. Her essays have been published in Colonize This, When Race Becomes Real, Utne Reader, and Ms. magazine. Her Notes From the Trenches ebook series documents the challenges of the writing life. She keeps an archive of her writing and art at kiiniibura.com. When the World Wounds is her second short story collection.